Foreclosure activity in the U.S. declined on a year-over-year basis for the first time in six months. RealtyTrac said today that there were a total of 109,561 foreclosure filings (default notices, scheduled auctions and bank repossessions or completed foreclosures) nationwide in August. This was a -12 percent change from July and -6 percent from August 2014 and followed five consecutive months in which foreclosure filings exceeded those of a year earlier. The filing rate equated to one in every 1,205 U.S. households. The decrease in filings came mainly at the front end of the foreclosure process with foreclosure starts falling to their lowest level since almost three years before the more or less official start of the housing crisis. The 45,072 starts in August was a 1 percent reduction from the July number and 19 percent below a year earlier. RealtyTrac said that, so far in 2015, foreclosure starts have averaged 49,362 per month, below the pre-crisis average of 52,279 per month in 2005 and 2006. Foreclosure starts decreased from a year ago in 30 states, including California (-29 percent year-over-year), Florida (-40 percent), New Jersey (-38 percent), Texas (-17 percent), and Maryland (-26 percent). But as usual, improvements in foreclosure statistics are geographically uneven and starts increased year-over-year in 19 states, including New York (+20 percent), Virginia (+16 percent), Missouri (+77 percent), and Massachusetts (+61 percent) and Minnesota (+20 percent). "Foreclosure starts in August continued to search for a new floor below even pre-recession levels, indicating the housing recovery of the past three years is built on a solid financing foundation," said Daren Blomquist, vice president at RealtyTrac. "But the continued rise in bank repossessions indicates more batches of bank-owned homes will be rippling through the housing market over the next three to 12 months as lenders list these properties for sale." Filings at the end of the process, bank repossessions, increased in 36 state and totaled 36,792 nationwide. This was a 22 percent decline from the previous month but still up 40 percent from a year ago, the sixth consecutive month with REOs increasing on a year-over-year basis. Bank repossessions in August were still well above their pre-crisis average of 23,119 per month in 2005 and 2006, but well below their peak of 102,134 in September 2010. Bank repossessions increased from a year ago in 36 states, including Florida (+23 percent), California (+31 percent), Texas (+168 percent), Ohio (+35 percent), and New Jersey (+295 percent). They declined in 13 states, including Georgia (-55 percent), Illinois (-22 percent), Wisconsin (-7 percent), Connecticut (-36 percent), and Kentucky (-45 percent). "This influx of bank-owned inventory may be good news for an inventory-challenged housing market, but buyers and investors interested in purchasing these bank-owned homes should understand they tend to be lower-value properties in areas where house values have not recovered as quickly and are more likely to have deferred maintenance issues that will need to be addressed," Blomquist noted. "The average estimated market value of REO properties nationwide is now 33 percent below the average market value of non-distressed properties, and homes that were repossessed in the second quarter of this year on average had been languishing in the foreclosure process for 629 days." A total of 41,308 U.S. properties were scheduled for a future foreclosure auction in August, down 14 percent from the previous month and 19 percent from a year ago to the lowest level since May 2006 - a more than nine-year low. This was about one-quarter of the peak for scheduled auctions in March 2010, but still above their pre-crisis average of 33,634 a month in 2005 and 2006. Despite the national decrease, scheduled foreclosure auctions increased from a year ago in 23 states, including New Jersey (+38 percent), Pennsylvania (+18 percent), New York (+64 percent), South Carolina (+ 38 percent), and Massachusetts (+ 21 percent). Nevada, Maryland, and New Jersey remain the most active states for foreclosure activity with Nevada experiencing a 233 percent jump in completed foreclosures over the last year. This drove a 4 percent year-over-year increase in foreclosure filings, making it number one for foreclosure activity again. 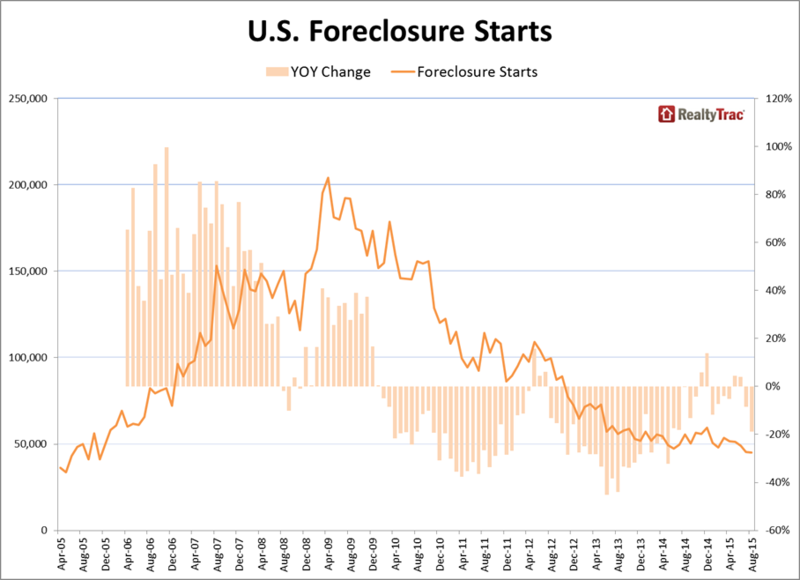 After holding that dubious honor for most of the duration of the foreclosure crisis it dropped lower in the pack in 2014 although remaining consistently in the top five. Maryland's overall foreclosure was unchanged from a year ago despite a 429 percent spike in bank repossessions, and the state posted the nation's second highest foreclosure rate for the third month in a row. In New Jersey filings increased 3 percent from a year ago - driven largely by a 295 percent year-over-year increase in bank repossessions and 38 percent year-over-year increase in scheduled foreclosure auctions - and the state posted the nation's third highest foreclosure rate for the third month in a row. Florida's foreclosure rate dropped out of the top three highest among the states for the first time since June 2012 thanks in part to a 33 percent year-over-year decrease in foreclosure activity in August to the lowest level since April 2007.